The sheriff from Amador County was very worried. Because he was cautious he had alarmed the National Police. At least that is what the local press said. Tens of thousands drugaddict Hippies threatened to create a chaos in the sleeping city at the end of October 1969. The Woodstock syndrom. But everything went very peaceful at the Gold Rush Rock Festival. In remembrance you have the image of a young man that idolizes the singer at the stage. An image from the Hall of Fame, that even 40 years later without words explains everything. Also because these famous legs and the fantastic human being that goes with those became a true legend in the years to follow. And a very lively one. At the age of 73 she doesn’t sentimentally look back at her past, but she looks forward with curiosity. 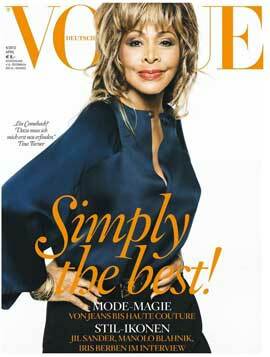 She doesn’t want to go back to the stage says the Queen of Rock and Roll in this Vogue interview. Because the showfigur Tina Turner and the private person Anna Mae Bullock were separated from each other. “Before I reinvent myself and return with something totally new I don’t want to go back and make myself smaller, because it was great!". To let rest the glorious past and try something new is probably one of the most difficult things living legend scan do. “Tina will come to the phone rigthaway". In Erwin Bachs voice you can hear the coziness of the Rhine and Cologne, but don’t let this fool you. Because this isn’t just Tina’s partner for already a very long time, but also the man that protects her from intrusiveness by the media. He checks everything that comes his way and organises it and that is why she can live the withdrawn and relaxed life, that she has today. And then she is at the phone. Her voice even with 73 so warm and powerful like in her greates hits from Nutbush City Limits to The Best; unmistakably Tina Turner. 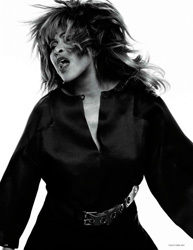 The interview takes place two days before the Photoshoot and she is a bit worried that the photographers will come to take pictures of Tina Turner. 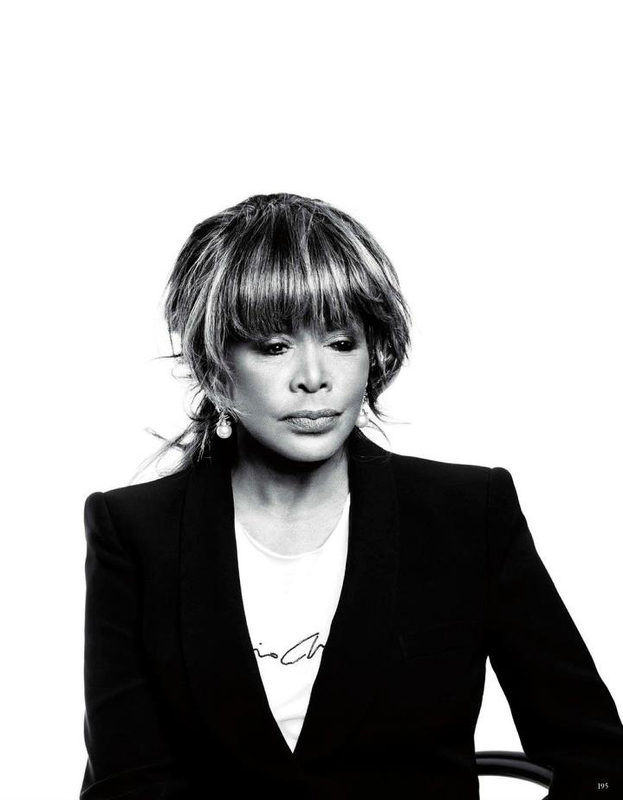 “Tina Turner is who I am on stage, but apart from that there is my real identity, the one that I see as myself.I surely hope that the images will reflect a certain peace of mind. That they will represent who I am now at this age". In the photoshoot she will also support the clothes of Armani. She picked them herself. She loves Armani already for a long time, because she finds his clothes “comfortable and elegant". When we receive the images a couple of days later the entire Vogue editorial staff is perplexed by the incredible vitality, that is always there – from the relaxed and souled portraits that were taken in her house in Küsnacht to the typical Tina poses from the photo studio. You can learn from Tina Turner that peaceful also can mean very lively. 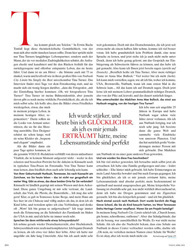 From your birthtown Nutbush, Tennessee, to Küsnacht at the Zürichsee where you live now – that isn’t only geographically a long way, but is there anything that connects those 2 places? TT: Küsnacht lies in the country and has meadows and croplands. The entire environment is very wellknown to me. The stock, the horses, the farms.. I like that very much! Of course in Tennessee there were no mountains and my house here at the lake is a chateau and completely different to what I lived in when I was a child, but I feel, the connection and often I think: “Wow! This is how I grew up". I still have the memory of the beauty of the farmlands in the south of the USA and I still love them very much. Do you speak a bit Swiss German already? 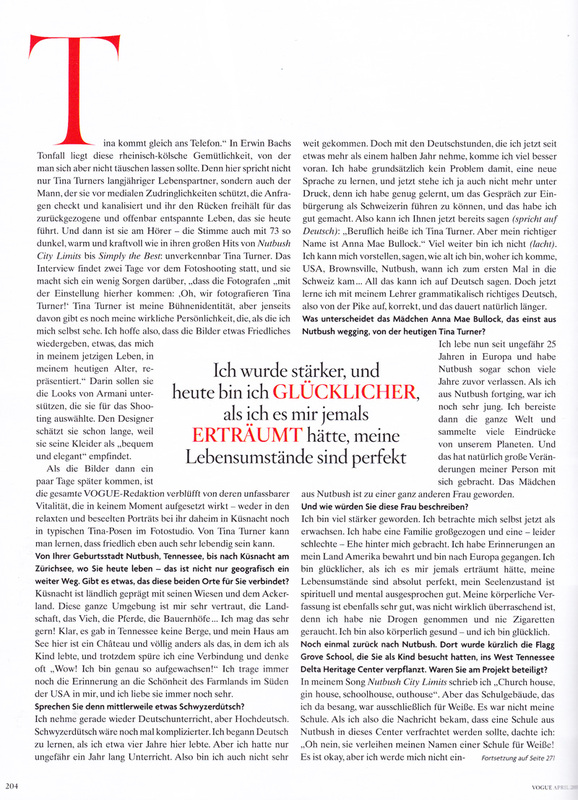 TT: I am taking lessons in German. Because the Swiss German is very difficult. I started learning German when I lived here for four years. But I only took lessons for a year. But I didn’t come very far. But with the German lessons that I have been taken now for half a year, it is going much better. I don’t have a problem learning a new language at all and there is no pressure anymore. Because I learned enough to be able to have the talk to become a Swiss citizen and I did that well. And I can tell you now (she talks in German): professionally my name is Tina Turner, but my real name is Anna Mae Bullock. Much more than that I didn’t get (laughs). I can introduce myself, tell how old I am, from where I come, USA, Brownsville, Nutbush, when I came to Switzerland for the first time… All of that I can say in German. But now I learn with my teacher to speak the right grammar, from the beginning and that takes more time obviously. What is the difference between Anna Mae Bullock, who left Nutbush one day and the Tina Turner of today? TT: I live in Europe now for over 25 years and had left Nutbush already a very long time ago. When I left Nutbush I was very young. I travelled all over the world and gathered lots of impressions from our planet. And that lead to big changes in my personality. The girl from Nutbush has become a totally different woman. And how would you describe this woman? TT: I became so much stronger. I see myself as an adult. I raised a family and had a rather bad marriage. I kept the memories of my country America and went to Europe. I am more happy than I ever could imagine. My life is perfect, my soul is spiritual and mentally I feel very good. My physical constitution is very good too, but that isn’t a surprise, because I never used drugs or smoked a cigarette. So I am physically healthy and I am very happy. Lets go back to Nutbush one more time. They moved the Flagg Grove School, that you went to when you were a child, to the West Tennessee Delta Heritage Center. Were you part of this project? TT: In my song “Nutbush City Limits" I sing “Church house, gin house, schoolhouse, outhouse". But the school of which I sang was a school for white people. It wasn’t my school. So when I got the message that they moved a school from Nutbush to the Center I thought: “Oh no they attach my name to a school for white people!". It is ok, but I don’t want to be involved! But later on I learned that Flagg Grove was moved, the school I mean, and that is the one that I went to. The school and the land on which it stood belonged to my great grandfather Benjamin Flagg… Now I am involved and that will become even stronger with time, since I know that is has all to do with my background, with my family. And I am very proud that I am the one of my family that can preserve this history. At the website of the Heritage center they say that the Flagg Grove school is one of the few preserved afro-american schools. What kind of school was it and what kind of memories do you have of the school? Were you a good student? TT: Just one room! And there were lessons for 3 groups, from one to 3. The school was from 8 in the morning till 3 in the afternoon. I walked to school, because there were no busses. I went with my sister and on the way we met other schoolmates who also lived in our village. It was really nice. I wasn’t a very good student, but my schoolmates and my teacher liked me. That did help me to succeed. My true talent was in another area, that helped me through my life, my talent for singing and dancing. Are there any relatives of you still living in that area? And do you go back there from time to time? TT: I was there for the last time when a member of my family still lived and after her death I took care of the house. What is still there from my family are more distant relatives like nieces, that I don’t know at all. I don’t have contact with anybody there anymore. Do you have any plans to go back to the stage again? Your last tour was a huge success. TT: I did my last tour when I was 69 and I see that as my farewell tour. I hope everybody can accept that. The work that I did was to the limit what I still could and would do physically. On top of that I don’t want to present myself anymore like on stage with those short skirts etc. I ended that. I did this job and brought it to a good end and now I enjoy that I don’t have to perform anymore or to be on stage anymore. I wait for the inspiration to do something else, because I know a lot of people want me to do something again. And I realised what I meant to so may people when I was on stage. But that’s over. I really did a good job and stopped in a good way. And before I re-invent myself and pop up with something new I don’t want to come back. I don’t want to make what was smaller than it was! So until I feel I can come back in a way in which I feel good I simply wait for the inspiration. But at the moment I don’t have any plans. Also not for a new album, book or film? TT: That depends on the film. To play roles of a mother(laughs), action, adventure, drama, that is what is interesting me. But I am not to eager. Recordings are very tiresome! You have to get up at 4 in the morning and to learn the text that is difficult. It is a tough job. We are working on an album at the moment. It is the third Beyond album with buddhist and christian songs. Those are inspired on old and new writings from masters from different cultures. I record them with my friends Dechen Shak-Dagsay and Regula Curti. This time a young Indian girl is with us. Sawani Sjhende-Sathaye. I just speak on those recordings. I don’t sing. Beyond 3 will be released this year. If you mean an album with new songs, that would only be interesting for me i fit was really good material. I want to make contemporay music, not music of the past. But I am not quite sure about that. Because I love nowadays music, but I also like music from my time. So I don’t know yet what kind of musici t should be. Are there any young musicians or singers that you really like? TT: I like those that do something different. I also listen to what is in the Top 10 in Switzerland. I like Rihanna very much and the music of Adele reminds me of my youth. I also like Beyonce, her elegance. There are a lot of good acts at the moment. The music goes in the direction of pop. A lot of people complain that the Rhytm and Blues of today isn’t as good as in the time of Motown. And it is right it is more like pop music. But I think that is good, because often Rhytm and Blues can be a bit depressive. So I like the nowadays music. And a mixture of those two would be great for me. countries, cultures, languages etc. Did you realise then that you did something that nobody before you had done? TT: I kno wit now. What I reqalised then is that for the first time I had a manger who asked: “What do you want?". That is of course the job of a manager. I told him: “I want to be like the English groups, like the Rolling Stones and I want to fill big arena’s". And my manager said: “Tina you have to make albums". Albums will fill the arena’s". And when you start with that the next day, you don’t think about what you are doing. You just go to your job. And that did mean that you met producers. And that you travelled. Because in America nobody was interested in me. They thought I was history. So I went to Europe and met producers like Heaven 17 and Mark Knopfler, who wrote “Private dancer". Or Terry Britten from Australia, who produced most of my songs. I was so busy that I didn’t have any personal life! My life was alla bout Interviews, Tv shows, Videos and Tours. That was the price to success. A lot of people thought that Tian Turner was history! They only knew Ike and Tina Turner and didn’t understand what was going on. So I had to test myself. And that meant work and not tot hink much about it. The circumstances in my life wer good. I lived in good hotels, had good people around me, played always with the same band, with which I started when I started my solo career. They became my family. So I was happy where I was. But I didn’t realise what was happening to me. That came later. Now I am very proud that I pulled through. That I really went this way. But it also was very tough! You became a Buddhist in the seventees, long before it was common i the western society. How did you discover i tand who has helped you in the past and what does it mean for you now? TT: I was raised as a baptist. In a baptist congregation. But I was very unhappy in my life as well as in my marriage. The buddism touched me. When somebody told me that by saying the mantra “Nam Myoho Renge Kyo" I could change my life I was moved. These mantra’s that you repeat over and over again work on the brain. That is what I learned form the Buddism. When you repeat these words every day at the exact time and in the exact same way it has a big influence on your subconsciousness. Everything changes then. Every pattern, every blockade that you were born with changes. False thinking patterns are changed by repeating over and over again this mantra. That was the beginning. I started to practise Buddism. And it has helpedme though my divorce and through all my difficult things in my life. It has led me to my new life. TT: I am a completely different person from what I was then. The way how I think has fundamentally changed. The past 35 years I developped that. I was never a truly bad person or mean to others. But now my goal is to have a life that is worth to live, to become a better and responsible person towards other people every day. And not only the people in my environment, but to all people.